Ohio is unusual in having the only state flag that is not rectangular. Based on the Cavalry Guidon carried during the Civil War, the pennant shaped flag displays a modified version of the stars and stripes. The shape is a tapered burgee. The seventeen stars refer to Ohio's position as the seventeenth state to join the United States. Ohio entered the Union March 1, 1803. The red circle represents the Buckeye, the Ohio state tree, surrounding the Buckeye is a white O, this is for OHIO. The blue triangle represents the hills and the valleys. The red and white stripes signify the Ohio's rivers and highways. The top, middle and bottom stripes are red, the other two are white. The flag flew for the first time over the Ohio Building at the 1901Pan-American Exposition in Buffalo, New York. The flag was designed by John Eisenmann in 1901. 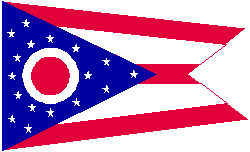 The Ohio legislature adopted the flag May 9, 1902. § 5.04 Coat of arms of state. The coat of arms of the state shall consist of the following device: a circular shield; in the right foreground of the shield a full sheaf of wheat bound and standing erect; in the left foreground, a cluster of seventeen arrows bound in the center and resembling in form the sheaf of wheat; in the background, a representation of Mount Logan, Ross county, as viewed from Adena state memorial; over the mount, a rising sun three-quarters exposed and radiating thirteen rays to represent the thirteen original colonies shining over the first state in the northwest territory, the exterior extremities of which rays form a semicircle; and uniting the background and foreground, a representation of the Scioto river and cultivated fields. When the coat of arms of the state is reproduced in color, the colors used shall be substantially the same as the natural color of the terrain and objects shown. HISTORY: RS § 15; S&S 729; 65 v 175; GC § 30; Bureau of Code Revision, 10-1-53; 132 v H 164 (Eff 12-15-67); 146 v S 213. Eff 11-20-96.